Bioreactors provide an efficient method for generating or refining products for the food and beverages, farming, pharmaceutical and cosmetic industries. Find out what a bioreactor could do for your business. The dairy and brewing industries have used biological conversion processes to create and modify products for millennia. More recently bioreactor systems have been applied to a whole range processes such as agriculture, food and healthcare, and fine chemical production. Bioreactors provide a sterile or aseptic controlled environment to ensure the quality and purity of an end product.Bioreactors provide an efficient method for generating or refining products for the food and beverages, farming, pharmaceutical and cosmetic industries. 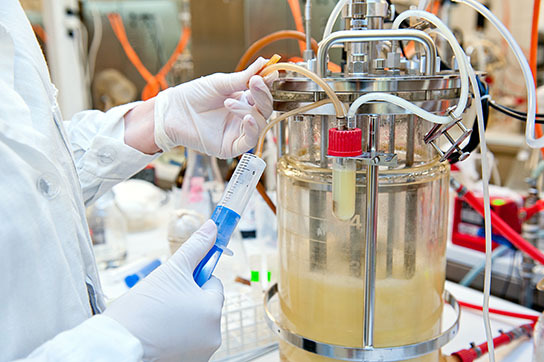 Find out what a bioreactor could do for your business. The dairy and brewing industries have used biological conversion processes to create and modify products for millennia. More recently bioreactor systems have been applied to a whole range processes such as agriculture, food and healthcare, and fine chemical production. Bioreactors provide a sterile or aseptic controlled environment to ensure the quality and purity of an end product. Identify opportunities within your business which could benefit from the use of bioreactors by comparison with case studies. This module is aimed at small or large scale food, beverage or fine chemical manufacturers, general bio-processors, agri/food advisers, or anyone with an interest in bio-production processes.